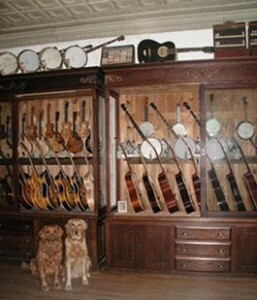 was already an experienced repair person and dealer in vintage instruments when he opened Spruce Tree Music in 1980. He opened his first full time shop, The Spicertown Folklore Center, in Akron, Ohio, in 1972. Later, he opened a shop in Bloomington, Indiana. Wil also occasionally teaches Fretted Instrument Repair at the University of Wisconsin National String Instrument Repair Clinics. Here’s a bit more about Wil from a Wisconsin State Journal story featuring Wil and instrument repair here. has a strong interest in traditional music. She has performed around the upper midwest, and taught guitar and old-time banjo while living in Minneapolis (where she also tried to achieve tenure as a graduate student). She moved to Madison and joined Spruce Tree Music in 1985. Her chief musical pursuit these days is fiddling for New England style contra dances. walked through the door in 1985 looking to teach banjo. It so happened that he was also an accountant and we needed an accountant… He maintained his association with the shop while living in Kentucky. He’s now back in Wisconsin, playing banjo and dobro with Art Stevenson and Highwater. hails originally from Belleville, Wisconsin (widely known as the UFO capitol of the country). Doug studied music at the University of Wisconsin and played bass with the local legendary band Marques Bovre and the Evil Twins. He joined Spruce Tree Music in 1994 as a general all-around guy and has become an accomplished instrument repair person. is a violist with the The Madison Symphony Orchestra. Beyond her extensive experience as a classical and jazz violinist/violist, Jen has explored a variety of other instruments such as Japanese koto and tenor banjo. She discovered her grandfather’s Roy Smeck Vita Ukulele, which has led her even further down the path of fretted instruments. All of this makes her a good fit for our shop. Prairie is Spruce Tree’s new Official Greeter. She’s young and overly enthusiastic, so she’s not permitted to greet you at the door. Piney (officially UH HRCH Truline Rio’s Pine Creek MH WCX) rests at home these days when not being playfully assaulted by Prairie. Not forgotten here: Traveler (HRCH UH Gaylan’s One With the Wind UD MH OA NAJ WCX VCX CCA), Zephyr (Zephyr Regent of Spruce Tree UD TD NA JH WC), Larson (Gaylan’s Lunar Far Side CDX TD OA OAJ VCD2), Harpo and Quinn.